We didn’t do it the easy way, of course. As soon as the match kicked off, Hull played with an fierce abandon that was in stark contrast to a nervy, brittle Arsenal. Even by our standards, conceding two goals within the opening eight minutes made for a bafflingly inept opening. The decision to start Lukasz Fabianski — one which I still consider sentimental rather than sensible — might have been looked upon rather less kindly had Arsenal not mustered a gripping fight-back. Fabianski was not individually culpable for the goals, but the defence looked unsettled by the absence of the regular No. 1. It could have got even worse. A Kieran Gibbs clearance on the line prevented Arsenal from going three goals down. A deficit of that size might have proved insurmountable. That clearance will rank alongside Gibbs’ last day, last-ditch tackle at West Brom as one of his finest contributions in an Arsenal shirt. A goal before half-time was vital to transform the game from a capitulation to at least a contest. Fortunately, Santi Cazorla produced a stunning free-kick to find the top corner from fully 25 yards. As Cup Final goals go, this was special — a strike to rival the Ray Parlours of this world. Quite the honour. However, crucial though Santi’s strike was, the momentum didn’t really swing in our favour until around the hour mark. Arsene Wenger withdrew Lukas Podolski and put on Yaya Sanogo. I must admit, I wasn’t convinced by the switch at the time, but adding a second striker to supplement Olivier Giroud immediately increased our attacking threat. He’s still more raw than steak tartar — a brute without the ball and Bambi with it. Nevertheless, his physical presence and fearlessness made him an effective sub. The manager has spoken about Sanogo’s enormous reserves of determination and self-belief, and both were evident in this FA Cup Final. After switching to 4-4-2 in both the semi and final of this competition, one wonders if Wenger is toying with the idea of deploying that formation more regularly next season. The identity of the two scorers who overturned Hull’s lead should come as no real surprise. Laurent Koscielny has a remarkable knack of scoring vital goals. In each of the past three seasons, he has notched in the games that have seen Arsenal secure fourth place. This weekend, he topped that by finding the net in an FA Cup Final. And then came extra-time, and the winner. It was always going to be Aaron Ramsey. There should have been no doubt. This was always his season. Even an absence of four months couldn’t prevent him from carving Arsenal’s 2013/14 campaign in his own image. A clever backheel from Giroud, a well-timed run and a nonchalant flick of the right boot saw the bottom corner bulge. Arsenal fans screamed out a decade of frustration. The party had begun. And what a party. I suppose it was inevitable that, after such a long wait, the club would celebrate in style. The scenes on the pitch were jubilant. 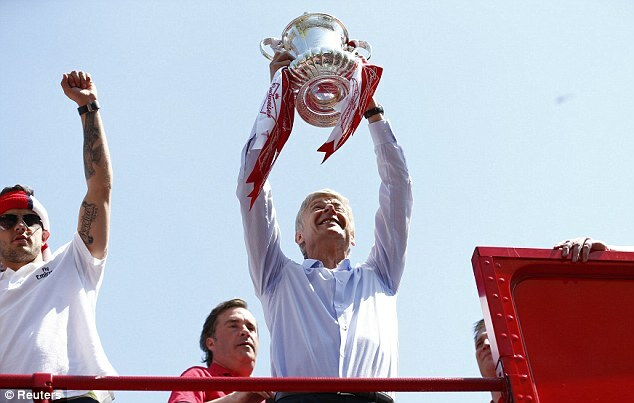 Even Arsene Wenger took off his tie and embraced the gleeful atmosphere. Kieran Gibbs shed a couple of tears, Bacary Sagna was locked in prayer, and Sanogo appeared to have taken a particularly exotic collection of hallucinogenic drugs. This party wasn’t confined to North London either. What has come home in the aftermath of this game is quite how big Arsenal are. This victory united a family that stretches right across the globe. 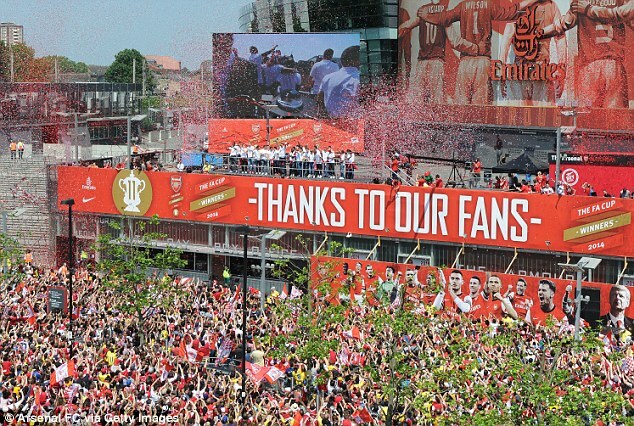 The parade in North London was rivaled by equally raucous scenes in supporters clubs in America, Asia and beyond. Last time we lifted a cup, Twitter didn’t even exist. Now, the ecstasy is indulged and shared with fans flung to the world’s four corners. We’re all Gunners, and this weekend we were all winners. It means so much to so many. To younger fans who probably don’t remember the last time we touched silverware. To younger players, for whom this was a first major triumph. Gibbs’ tears reflected the culmination of childhood dream. I thought of Tomas Rosicky, who has waited so long for this moment, and Bacary Sagna, who has punctuated his Arsenal career with a shining silver exclamation mark that ensures his place of history. And I thought of Arsene Wenger. My opinion on the manager’s future has fluctuated somewhat this season. His stubbornness frequently drives me mad. However, what’s never changed has been my desire to see him crowned a winner again. It’s eminently possible to be frustrated by someone’s obstinate ways, but love them dearly. I know I feel that way about most of my own family. Seeing him sing and dance on the podium gave me a warm, fuzzy feeling that I haven’t experienced for some time. Nine years, probably. Few could have anticipated quite how good it’d feel. The truth is, you forget. With each passing year, you console yourselves with familiar platitudes: “you can’t win them all”, “we’re doing well given our resources”, even the occasional “fourth is almost like a trophy”. It’s not. There’s nothing like being able to call yourselves Champions of a major competition.